There are tons of quality bed bug steamers available to homeowners and professionals alike. All are capable of killing bed bugs on contact, thanks to their 200+ degree steam tip temperature. However, there are a dizzying number of other features and specs that need to be considered when making a purchase decision. There are steamers with higher pressure, hotter temperatures, more water capacity, or more dials, knobs, or other gizmos than the rest. Choosing one steamer was a compromise between the features you care about versus the ones you don’t. Until now. 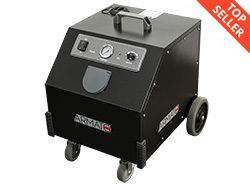 The all-new Armato 9000 aims to be a no-compromise commercial-grade bed bug steamer. It packs a powerful boiler, integrated heating element and super high capacity tank into an all-metal heavy-duty body. It even includes high-end features like continuous fill and CEME® solenoid control for an attractive price. Is the Armato the new end-all, be-all commercial bed bug killer? Let’s take a closer look and find out. Armato packs the 9000 into a spartan, no-frills white box. This isn’t a brand that’s trying to appeal to department store shoppers. Armato is an all-business brand that serves pest control professionals directly. This serious attitude continues through the unboxing; there are no stickers, pamphlets, or unnecessary attachments. The 9000 ships with exactly what you’ll need for pest control jobs and nothing more. The minimalist set of attachments and accessories include only the bare necessities for a proper bed bug treatment: the Armato ships with two extension tubes, a smooth flat fabric tool (affectionately referred to as a bed bug tool by Armato), a jet tip tool for cracks and crevices, a large floor head with an adapter, and two cotton covers to help break up excess moisture and pressure. Armato’s meticulous design can be seen in even the least conspicuous details. The hose is braided with Techflex® nylon to protect against crimping and tearing. The raceway casters feature double ball bearing assistance to keep them rolling and swiveling as smoothly as possible. The control console and carrying handle are reinforced to keep them secured to the body. With all of the thought put into the outside of the steamer, we knew we had to pop the covers open and take a look inside this beast. Note that we do this with permission from the manufacturer, and we absolutely do not recommend that you attempt to open your own steamer. Do not try this at home. On one side of the steamer’s generously spaced interior, we find the enormous water tanks, one pressurized and one unpressurized. The polymer reservoir tank can hold over a gallon of water, and can continuously feed into the pressurized boiler. Out of the box, the boiler is wrapped with styrofoam for insulation. Unwrapping that present revealed a beautiful double-walled stainless steel unit. This boiler is as durable and well-made as they get, and is backed with confidence by a lifetime manufacturer warranty. Flipping the steamer over gave us a chance to ogle the Italian electronics that make the Armato work. The microcomputer, responsible for things like steam control gauging and water level monitoring, is protected by a sturdy polymer enclosure. The Italian-made CEME® solenoid controller regulates steam flow into the hose. This reduces moisture and condensation buildup to ensure a consistently hot and dry steam. Generally, the rule of thumb is that larger tanks take longer to heat up to a boil. High-powered heating elements can help offset this extended heat-up time, and the Armato’s integrated heater is more than up for the task. The Armato’s indicator light changes from red to green in less than 9 minutes, indicating that the boiler is primed and ready to release its steam. This is noticeably faster than the 15-20 minutes that a less powerful boiler would need to heat up that amount of water. When we pulled the trigger on the Armato’s ergonomic steam gun, the first thing we heard was the distinctive click of the CEME solenoid activating, followed by a torrential rush of hot, dry steam. The 9000 is named for its 90-PSI steam pressure capability, and this steamer lives up to its name without hesitation. This super high pressure is among the highest we have sampled, and will ensure that the steam adequately penetrates into cracks and crevices to hit bed bugs where they are hiding. Steam pressure is only half of the equation, as steam is little more than a propulsion method to deliver heat where pests are hiding. Fortunately, the Armato won’t let anyone down thanks to its class-leading heating power. The 320-degree boiler can produce tip temperatures of up to 284 degrees Fahrenheit, which is more than enough to kill bed bugs of any age on contact. Coupled with the high pressure rating, the 9000 should have no trouble killing pests even several inches away from the tip of the steam nozzle. The Armato 9000 handily exceeds our expectations in all of the right places: it has more durability, more power, more capacity, and more control than any other steamer in its class or price range. The only steamers that come close to it are much more expensive, such as the ~$1,900 EnviroMate Pro EP1000. We have no doubt that there are other commercial steamers out there that fit the needs of professionals considering the new Armato. There are some steamers with similar pressure ratings or boiler power; there are even a couple with similar tank capacity. However, all of the competitors compromise in places where the Armato does not. There is nothing out there that matches the Armato for its construction, power, capacity, features, and price. In a world full of compromise, the Armato stands out as an easy choice for professional pest control. Arm yourself with the most powerful dry vapor steamer available! The Armato’s incredible 90 PSI steam output is unmatched in its class, providing consistent penetration into any soft materials.